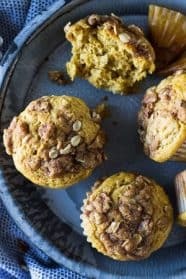 These Pumpkin Streusel Muffins are the perfect fall breakfast or snack! They are perfectly moist, full of pumpkin flavor, spiced perfectly and topped with a crunchy streusel topping! Preheat oven to 350 degrees F. Lightly grease or line and 12 cup muffin tin and set aside. STREUSEL TOPPING: In a small bowl combine the brown sugar, flour, pecans, oats and cinnamon. Stir in the melted butter, set aside. MUFFINS: In a large bowl combine the flour, baking powder, baking soda, pumpkin pie spice, and salt. Add in the remaining ingredients and stir just until combined. Using a large ice cream scoop, fill muffin cups evenly. Sprinkle with topping and bake for 18-20 minutes or until a toothpick inserted in the center comes out clean. Cool in pan 5 minutes before removing.